Please provide us with some quick information and we'll get right back to the good stuff. It'll be worth it - we promise! Get emails for future webinars and guides? Every year brings new opportunities for digital marketers to beat out their competition when it comes to finding and engaging the best potential leads. 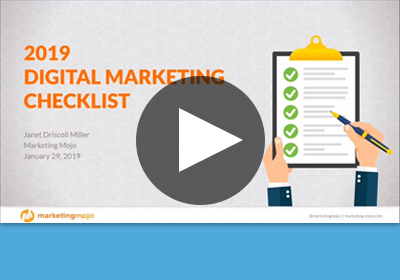 This on-demand webinar provides highlights from our 2019 Digital Marketing Checklist, showing you key areas of focus that will make your website and digital ads stand out from the crowd. Compiled from our proven experience and success with clients across a variety of industries, the tips and specific recommendations outlined in this webinar are targeted to the opportunities and challenges we face as marketers right now.